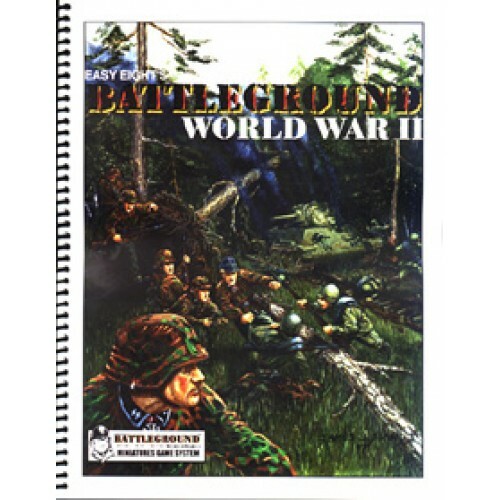 Battleground WWII Main Rules by Easy Eight Enterprises. The basic rules cover Americans, Germans, and Russians. Each inch on the tabletop represents "...the distance a man can crawl in one action." Each turn represents "...the time it takes an average soldier to aim and fire a bolt-action rifle twice while being shot at." Each figure represents an individual combatant. Intended for use with 15mm or 20mm figures. 120+ pages of rules in a 3-ring binder, 3 sheets of markers/counters (one sheet in color, others in black and white) (must be mounted and cut apart). Requires use of standard deck of playing cards (not included). Designed by Brad Sanders, Devin Cooley and Bob Brodeur. Figures and dice not included. Battleground rules and supplements are printed locally, there maybe a few days delay to get them hot off the press.